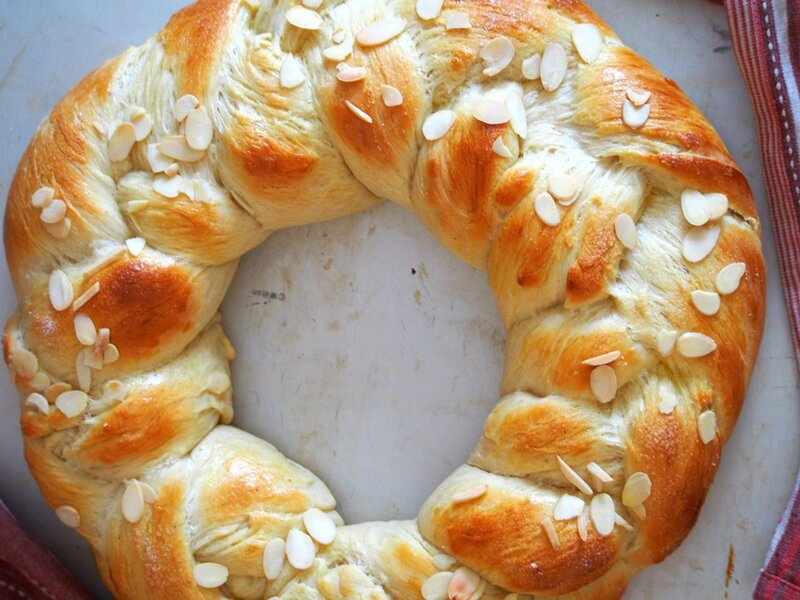 Finnish Pulla is a celebration bread braided beautifully like a wreath. 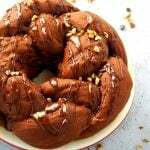 It gets its nice flavor from the cardamom and it is adorned with crunchy almonds as finishing on top. The cold season approaches again. A week ago, snow came down on us like winter means serious business, already. I guess we are on the last few days of seeing the brown soil on the ground, soon to be covered with snow. 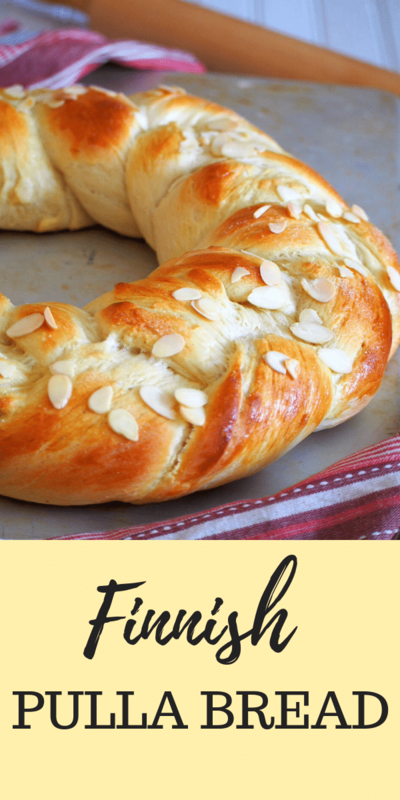 But then, instead of freaking out, I have willed myself that it is better to relax and do some therapeutic kneading of dough, and maybe a little braiding for added fun. There is nothing cozier than being indoors on cold days, savoring the aroma of bread baking in the oven. 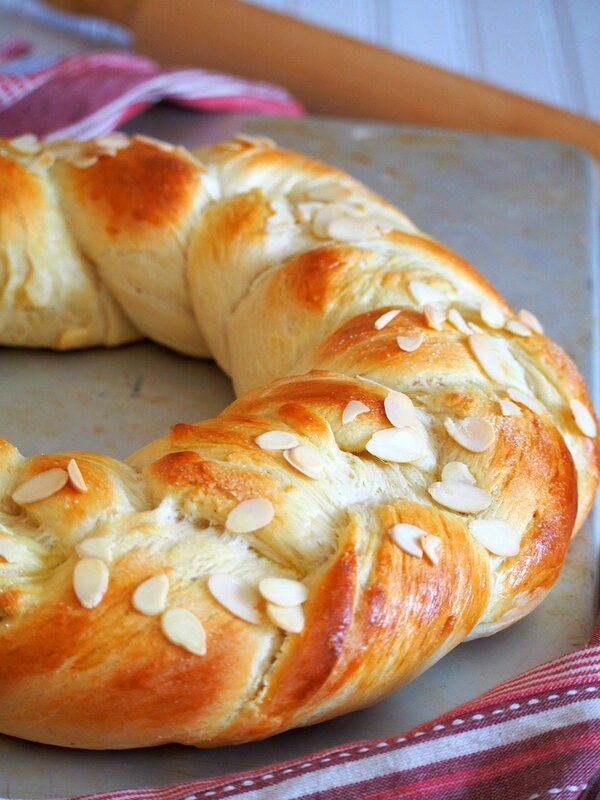 It is a perfect day for this Finnish Pulla Bread, it seems. 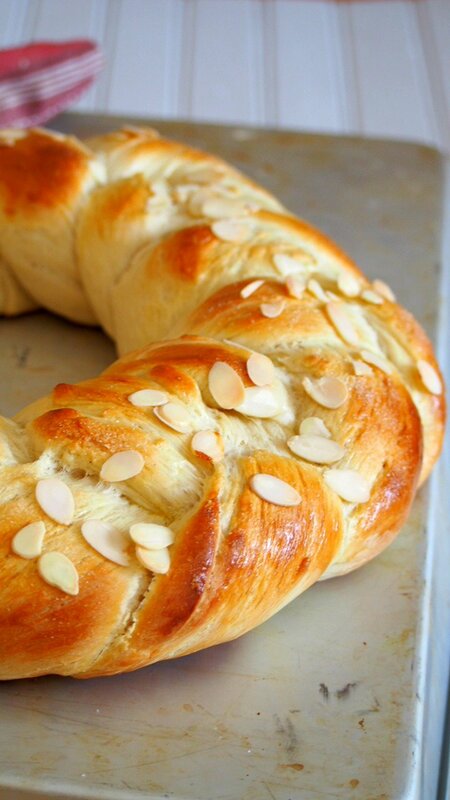 This Pulla recipe yields a cardamom- infused bread. For that reason, it has a nice touch of fresh, bright flavor that is noticeable yet so subtle. If you have not tried cardamom before, this recipe is a perfect way to get introduced to it. This introduces you to the pleasing, and unique flavor profile of cardamom spice. You start off by proofing the yeast in warm water in a large bowl. Once the yeast is foamy, stir in warm milk, eggs, cardamom, sugar and salt. Add 2 cups of flour and use a wooden spoon to stir the mixture until smooth. Stir in the butter, then add just enough from the remaining flour 1/2 cup at a time, until a soft dough is formed. The consistency should be like the one shown in the photo below, soft, shaggy and not dry. Cover the bowl with plastic wrap and let the dough rest for 15 minutes. Then turn it out on a lightly floured surface and knead for about ten minutes, until it smooth and elastic. 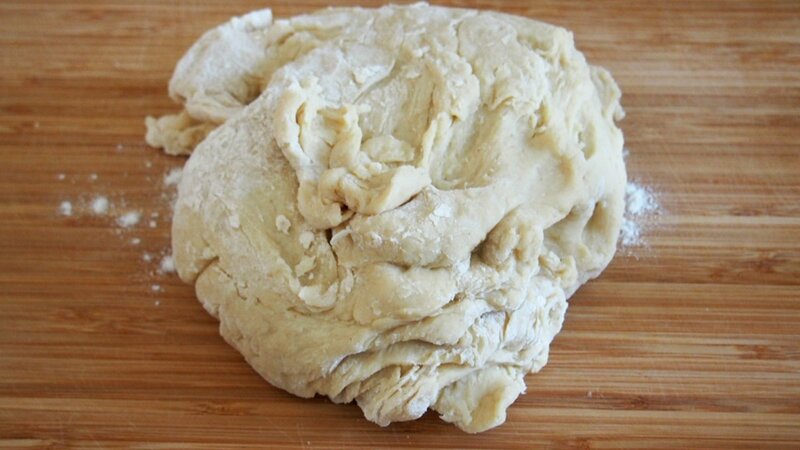 Knead the dough using mainly the heels of your palms, pushing the dough downwards and away from your body. Use your weight as you do so. Once the dough is somewhat a flat mass, Fold the dough in half over itself and start the pushing and kneading motion in your palms again. Repeat until dough is smooth and elastic. My favorite way to test the doneness of dough is the windowpane test. Shape the kneaded dough into a ball and let it rise inside a bowl, covered. This should take 60 minutes or so until the dough is doubled in size. Gently knead the dough briefly just to deflate. Divide it into three equal portions. Roll each portion into a rope that is 36 inches long. Starting from one end, braid the three ropes together until you reach the other end. Lift it up to place it on a 14-inch pizza pan that is lined with parchment paper. As you lay it down, shape it into a circle. Seal the ends by pressing them together to close the circle. Tip: When you join the two ends together, don’t just connect the ends, make the ends overlap by putting one over the other. This ensures that this part of the wreath is not thinner than the rest of the circle. Let this rise for about 45 minutes, covered loosely with a clean kitchen towel. 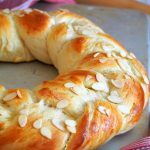 Preheat oven to 375 F. Brush the surface of the dough with the egg glaze, sprinkle with sugar and top with sliced almonds. 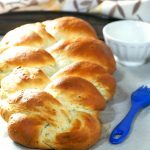 This Pulla bread is a stunner out of the oven. No worries that it is cold outside. I will grab myself a slice, pour out a mug of tea and stay warm inside. Anyways, It is not that bad. The window shows the stunning outdoors this time of the year. Beautiful with all the colors of Fall. Life is good. 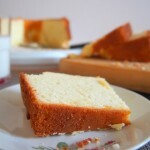 Did you make a recipe from the blog? I’d like to see! Tag me on Instagram or Facebook. In a microwave-safe bowl, warm the milk until it reaches 110 F. In a large mixing bowl, stir the yeast in warm water and let it sit for about 5 minutes until foamy. Add the milk, sugar, cardamom, salt, and eggs to the large bowl and stir with a wooden spoon to incorporate everything. Add 2 cups of flour and stir until smooth. Stir in the butter and add just enough of the remaining flour 1/2 cup at a time until a soft dough is formed. The dough should be able to gather together in a shaggy mass but is not dry. Cover the bowl with plastic wrap and let it rest for 15 minutes. 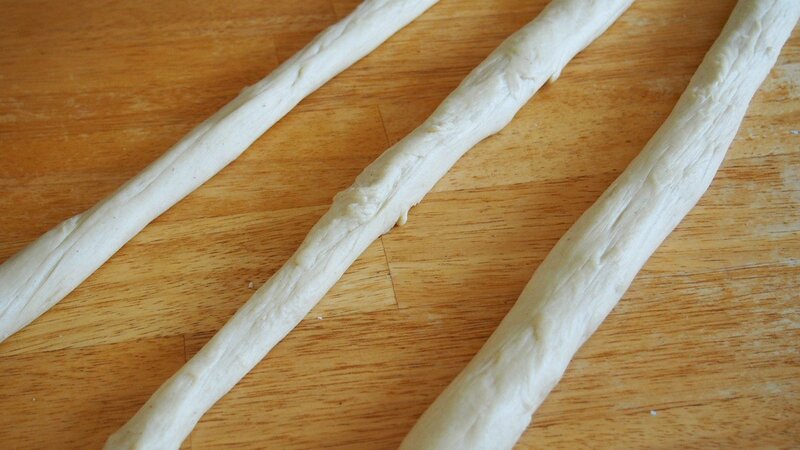 Turn the dough onto a floured surface and knead for about ten minutes, or until it is smooth and elastic. Shape it into a ball and place it in a bowl. Cover the bowl and let the dough rise for 1 hour or until doubled. Line a 14-inch pizza pan with parchment paper and set aside. 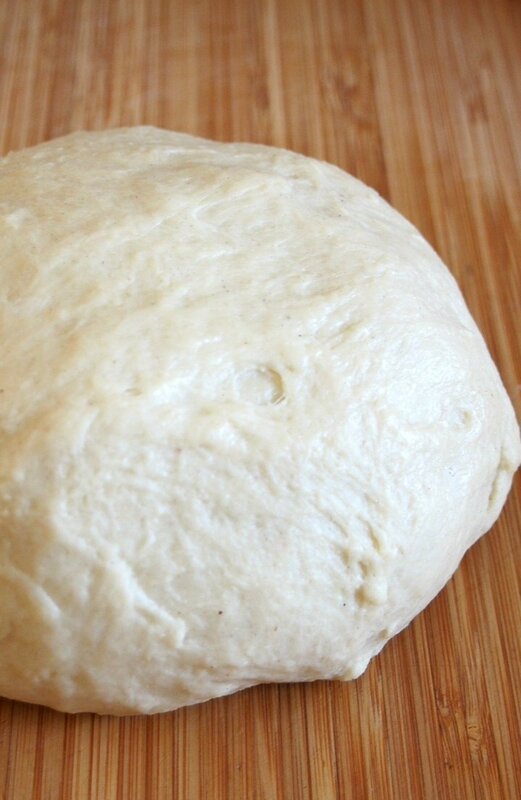 Lightly knead the dough just to deflate it and divide it into 3 equal portions. Roll each portion into a long rope of about 36 inches in length. 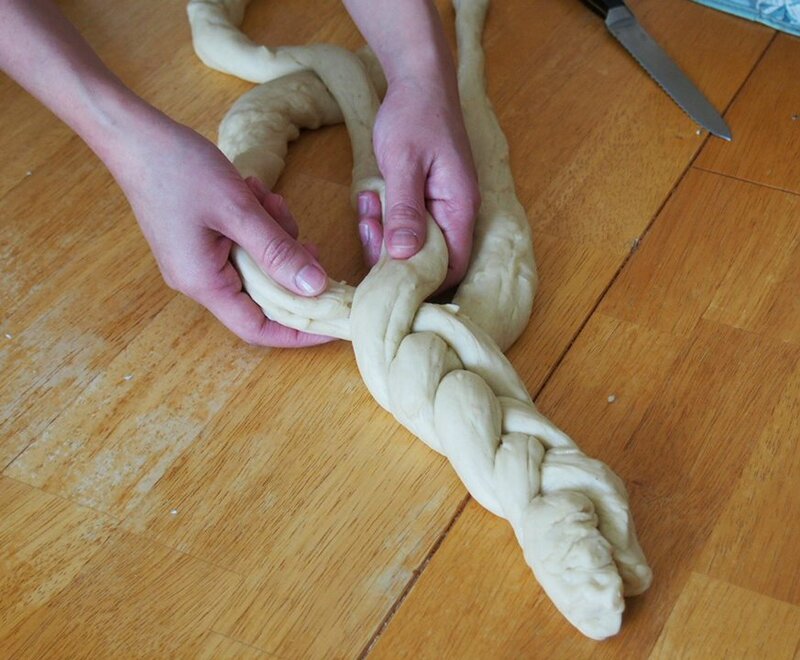 Braid the three ropes of dough from one end and once you reach the other end, lift the dough and transfer it to the pizza pan, shaping it into a circle as you lay it down. Pinch and seal the ends together to close the circle. Cover the assembled dough with a clean towel and let rise for about 45 minutes until puffy, but not necessarily doubled. Preheat oven to 375 F. Beat one egg with 1 tablespoon of milk and brush this glaze over the surface of the dough. Sprinkle the top with sugar and almonds. 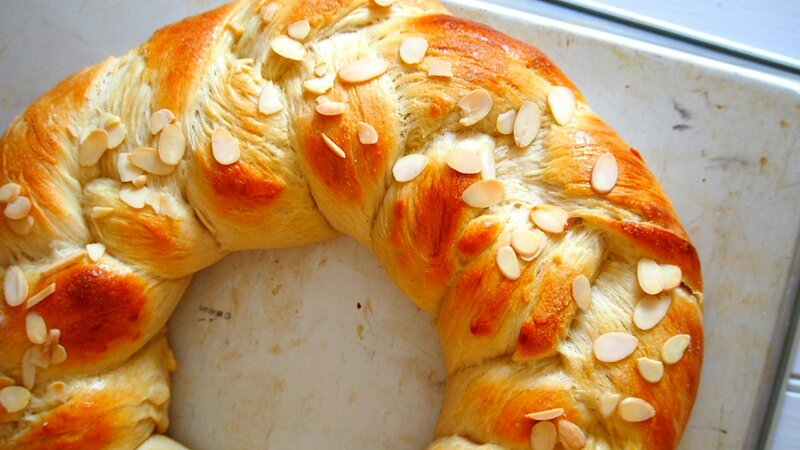 Bake pulla for 20-25 minutes, until lightly golden. 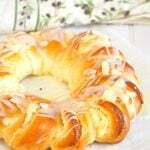 Recipe from Finnish Pulla from the book Baking with Julia. You make the loveliest bajed breads and pastries. I make your, Ube chiffion all tbe time. I’m obsessed with Ube I keep cooked pureed, ube in my freezer. I can, buy the purple yams hete in FL at the locsl farmers market. Love all you do. Your a very talented lady. Thank you very much! It makes me so happy that you appreciate what I do. Thanks for inspiring me and happy baking!